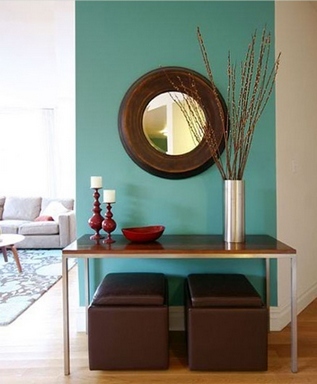 Interior Design Story: Can Brown and Blue Create a Good Color Combination? (though a lighter brown). I am going nuts trying to figure out what accent wall color would go with these curtains and what color bedding. What I dont want is the entire room in blue and brown hues! The rest of the walls are really a plain beige color and the furniture is all dark wood. What wall color is that? I love it. I'm doing that and brown in my washroom. Can you please tell me what paint that is? I love it and can't find one just like it. Is it Sherwin Williams paint?